This project takes place in the street. This space is a public space, regulated by a set of tacit rules which are not the “product of a conductor's organisational action” and which we have internalised during our childhood. “Thus we know “spontaneously” the “things we can do and what those cannot do, the things we can say and those we cannot say”” (1). There are many things we would not allow ourselves without even breaking the law. This set of individual and collective practices is called “habitus”. The Chicken Or The Egg interferes with this rule governed space. 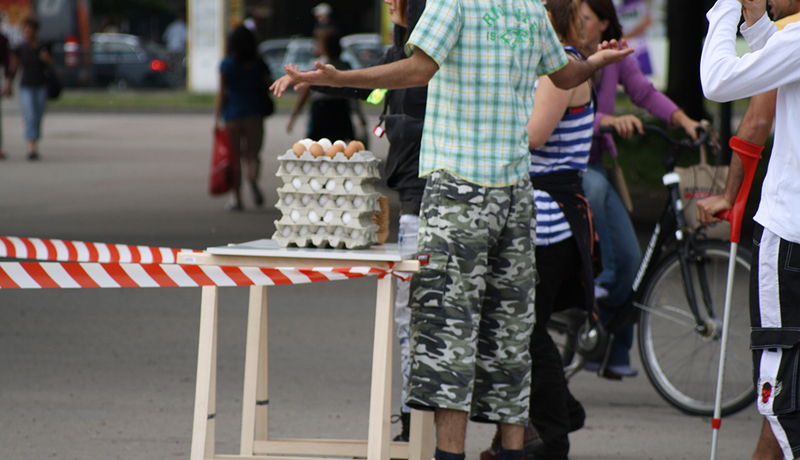 On a public square, one or two people install a table on which they place eggs and sometimes empty egg boxes too. The protagonist(s) stand approximately 4 meters away from the table keeping still and wait for the curious passers-by's reaction. Neither instructions nor answers are provided. The set up is not unfamiliar to European audiences for it is reminiscent of traditional games found on fairs or of a market stall, without being an exact imitation. However doubts about the set-up's purpose start arising because it takes place outside of the original context. The “suggested” game is tempting but passers-by do not take a chance when they are alone or in small numbers. If there are enough people on the square, a group forms itself and “in doubt, the individual uses the group as a source of information” (2). The bigger the group, the less room there is for doubt. Certainty gains ground. Once the limit is reached, conformism takes over and the framework is redefined (3). Criticism is limited: interjections like “not in the face” or “not so hard” take for granted the premise that throwing eggs is allowed. In this sphere, “Thou shall throw” becomes the norm. Questioning this would mean an understanding of the transition. Thus the performance produces a shift from one norm to another. However this potentially dangerous phenomenon is not inevitable as Hannah Arendt's philosophy offers many strategies to avoid it. The individual should think for themselves and by themselves within a collective consciousness. Yet this “norm” is never the same from one performance to the next. Reactions change because each situation is unique. This performance's repetition builds an efficient analytical framework, and in a personal way, one that is never defined yet necessary to understand and improve life in society. Far from emotional irrationality and reductive morals, this work “does not only question art itself but provides first and foremost a critical analysis of society through “interventionist sociological practice”" (4)(5). The Chicken Or The Egg “tends to consider Sociological Art as a mean of action against social and individual reality” (6)(7) and tries to raise personal and collective political awareness. While artists usually gauge performances from an aesthetic point of view, here they are used as an educational tool. The Chicken Or The Egg is an artistic research work. Research shapes the work, which is itself a process of research. This website describes the work's current state, ever-changing and transforming itself with each iteration. Thanks to everyone who believed in it from the beginning and still do: thank you all for your time, your work, and your patience. Finally thank you for your friendship. "Our central purpose is the construction of situations, that is, the concrete construction of temporary settings of life and their transformation into a higher, passionate nature. We must develop an intervention directed by the complicated factors of two great components in perpetual interaction: the material setting of life and the behaviours that it incites and that overturn it ."